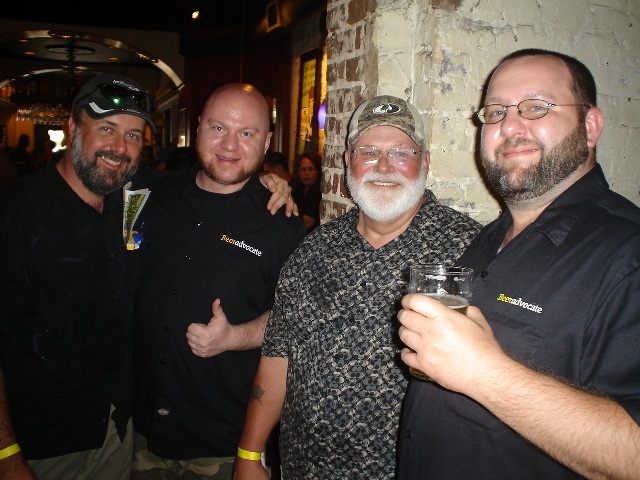 Brewtopia Events LLC beer report from the first annual Savannah Craft Brew Fest 2008. 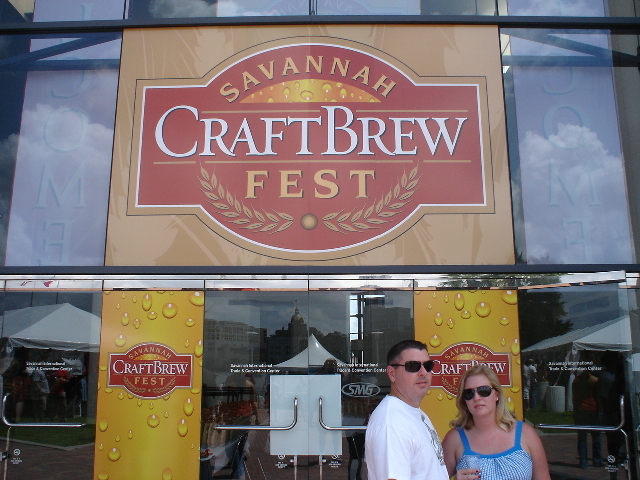 The first annual Savannah Craft Brew Fest took place August 29 & 30. 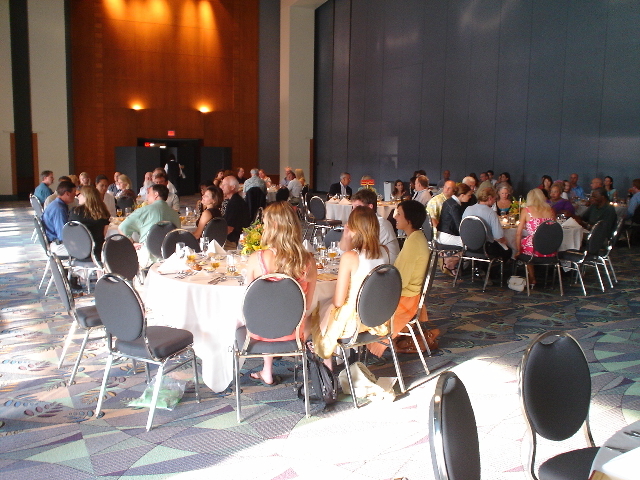 The weekend started off Friday, August 29, at 6 pm, with the Georgia Craft Brew and Food Pairing Dinner at the Ballroom of the Savannah International Trade and Convention Center. Tickets went for $100 per person. This delicious dinner featured the best of Georgia craft beers and food pairings, and brew-masters and chefs worked together to plan the pairings and discuss the menu choices. Proceeds went to Senior Citizens, Inc.
Then on Saturday, August 30, the Craft Brew Grand Tasting was held from 11 a.m. - 5 p.m. on the Esplanade of the Savannah International Trade and Convention Center. 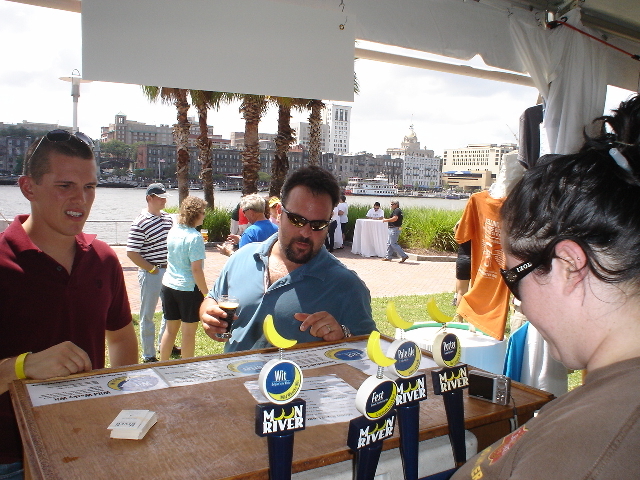 Overlooking the Savannah River and beautiful Historic Savannah, this outdoor event showcased 120 different craft brews, live entertainment, delicious food offerings and souvenir items for sale. The sultry weather did not deter the great crowd from enjoying the multitude of gourmet ales and lagers. Check out www.savannahcraftbrewfest.com for details. 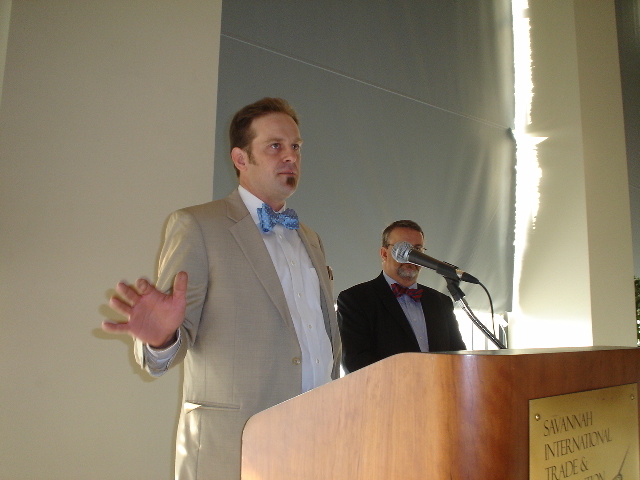 John Pinkerton (Moon River's owner and brewmaster) delivered a stirring beer "sermon" to the crowd at the Friday night beer dinner. The menu included a variety of savory appetizers, Provençal fish soup with prawns, roasted halibut with crushed potatoes, twice baked goat cheese soufflé, fire-roasted prime filet of beef with sweet white corn and chanterelles, and chocolate cake with a creme anglaise. 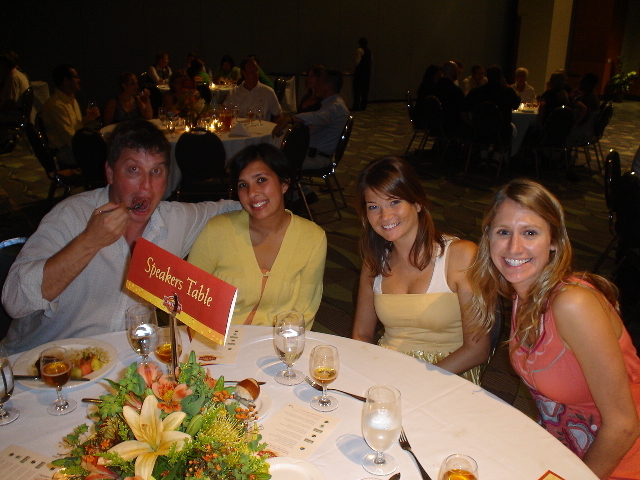 Diners enjoyed beers from Moon River, Sweetwater and Terrapin paired with each course. The Savannah International Trade and Convention center sits across the river from historic downtown. 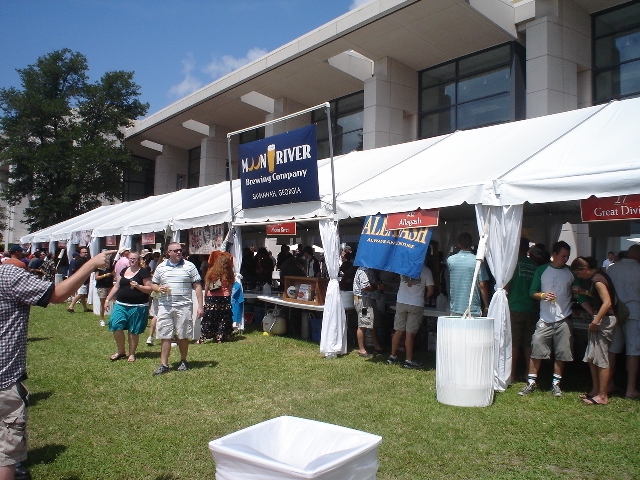 Brewery booths were positioned underneath three festival tents. 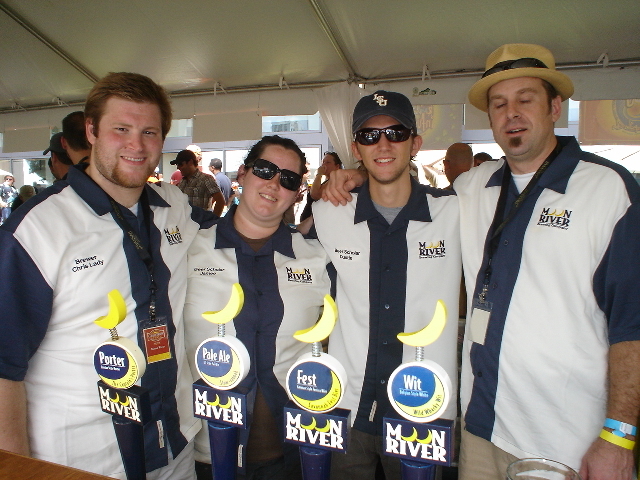 Moon River poured their delicious Wit, Slow-vannah Pale Ale, Festbier and Captain's Porter. Brewer Chris Lady (far left) and owner/brewmaster John Pinkterton (far right) pose with two of the brewpub's trained "beer scholar" servers Jamee Parsons and Dustin Davis. Katie from Thomas Creek Brewery and Simon of Savannah Distributing. 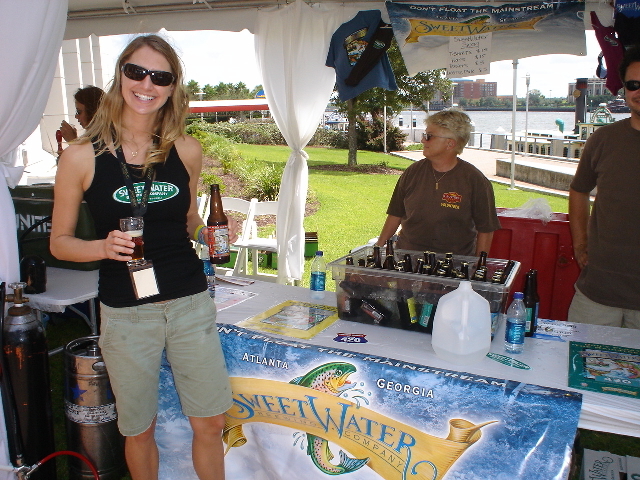 Jessica Gearhart represented Atlanta's SweetWater Brewery at the festival. 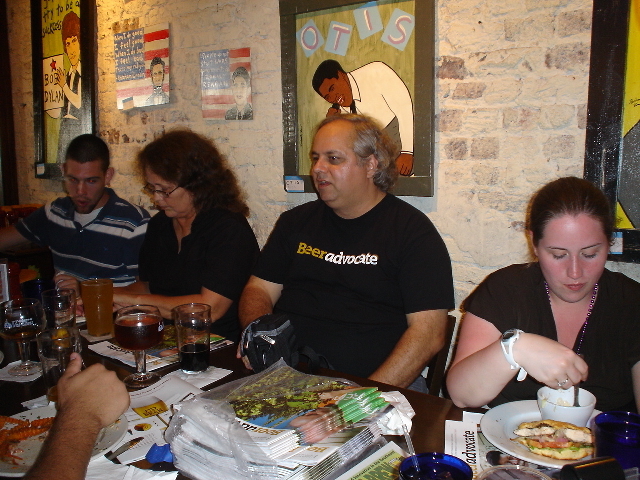 Almost 30 BeerAdvocates showed up for the post-festival pub crawl hosted by www.BeerAdvocate.com. BeerAdvocates Todd and Jason Alström (in the BeerAdvocate shirts) strike a pose with two BeerAdvocate members inside Moon River Brewing.